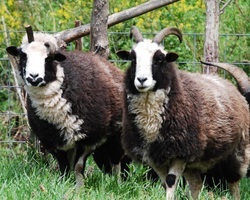 We make our products from wool sheared from our two Jacob Sheep, Kattherine and Bianca. After shearing the girls we clean, spin, and knit our various winter wear. We produce different colored yarns by combining the natural shades of their wool in varying degrees.